What happens when traders ignore a stock? You get narrow range candles and low volume. When you see this developing on a stock chart, it will remind you of a ghost town - deserted. Get ready, the stock is about to explode. The name "ghost town" refers to a low volatility setup. And what follows low volatility? High volatility! This repeats over and over again on every chart - in every time frame. With this chart pattern, you will see pullbacks into the Traders Action Zone that end in narrow range candles. These candles are also known as stars or doji's. Combine these price patterns with low volume and you have a winning trade in the making! 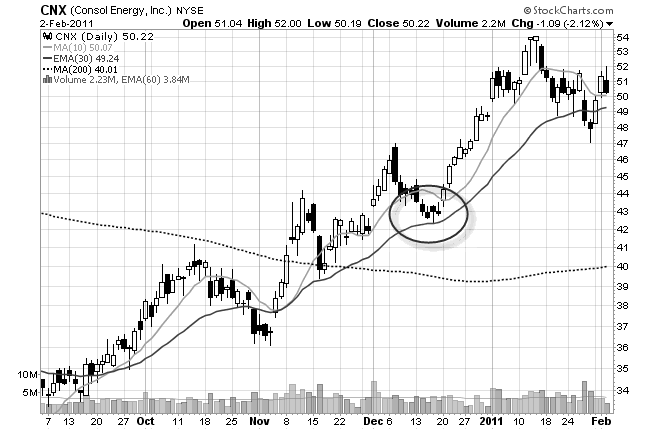 Note: In candlestick terminology, stars, technically have to gap away from the previous candle to be called stars. I don't find this to be necessary to trade them. See how AMB pulls back into the TAZ, there are narrow range candles (stars), and low volume? Now look at what happens at the next swing point high ($44.50). See the narrow range candles again? Volume drops off for a couple of days, momentum has slowed, and the stock pulls back again. This is where professional traders come into the stock. This can be tricky. When you have a potentially explosive situation, the stock can be prone to whipsaws. Here is how to avoid them. With this pattern, you want to avoid just putting your buy stop above the previous high. You will get likely get filled prematurely! Put your buy stop above the high of the highest narrow range candle. In the first example (long), there are three candles that I highlighted. The middle one has the highest high. Put your buy stop in above that. This is reversed for short positions. Wait for another pattern to develop before you enter the stock. Did you notice the T-30(s)? Move down a time frame to the 60 minute chart and wait for it to breakout. Many times the 60 minute chart will give you an early warning sign that the stock is about to break (in one direction or another). The most difficult part of this pattern is the entry. Many times the stock will move up and then sell off. Or, it will move down, and then rally. This can cause whipsaws. The advantage to this pattern is that your stop can be very close to your buy price, so your risk is small. If you get stopped out, consider another entry. The move that follows is usually worth it! There isn't anything special here. Just trail your stops using your favorite exit strategy. However, when the stock market offers you a gift, take it! If the stock explodes, and goes up 15% in a couple of days, at least take partial profits and trail your stops on the rest. Low volatility leads to high volatility. High volatility leads to low volatility. Narrow range candles mean that momentum is slowing. The buyers or sellers are losing strength. 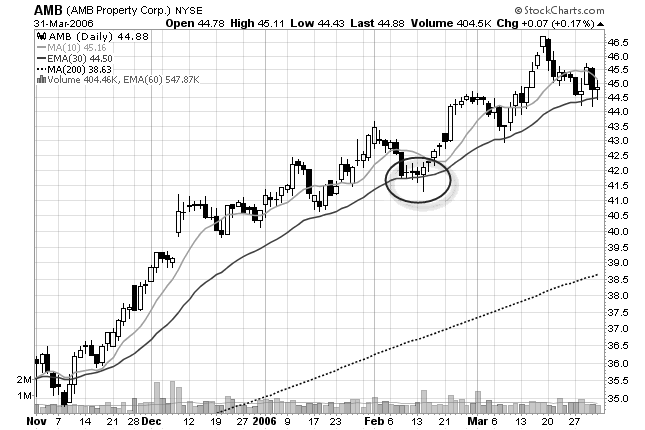 Always look to the left on the chart to make sure the stock is at a significant support or resistance area. It's amazing what happens on a stock chart. Right when everyone loses interest in a stock, it takes off. Go figure! Think of the ghost town pattern this way: When you see a pullback into the TAZ and narrow range candles develop, the price action that preceded it, is coming to an end.